A great day for for the first competition of 2009 ! Just a bit of a crosswind blowing out in the morning, with the mild wind shifting westerly, blowing straight down the strip right to left. Warm to hot at 34deg C, but the see breeze in the afternoon made it quite pleasant. A reasonable turn-out for the first event too with three in F3A, two in Expert, two in Sportsman and two coming out for the “Sports Aerobatics” class. It was great to see David and Steve Marriner out early to check things out and have a fly, and they had a great time and have promised to continue with the sport. They both flew well, and learned a few things on the day too, I think. 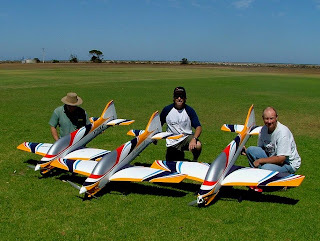 Steve flew solidly with an early 'modified' Virginia Slim, and David (Steve’s son) flew his colourful racer and showed some definite talent and skill in the short time he has been flying. We welcome them into “the fold” and look forward to many enjoyable competitions with them and watch them progress in the sport. The “main event” showed the potential this year has in South Australia. Dr. Chris Watson flew his second (and first full) competition showing some skill and form WELL beyond his early flying experience. Why is that? . . he is flying John Tonks nicely trimmed CPLR designed “Majestic” . . AND . . he has the skills of John coaching him ! ! . . HE CAN’T GO WRONG ! He will gain his first promotion point VERY soon. Chris won Sportsman from Jeremy Angel, however to be fair, Jeremy suffered and engine problem in the first round finishing him for the day. Expert class had Matthew Cosier with the tried and true Pinnacle/YS160 and put in some great flights, while Peter Ukhoff managed to eclipse Matt to win the class with his ever improving Integral/OS140RX. F3A saw John Tonks fly his new Sebart Wind 110E Electric plane in competition for the first time . . and WOW ! . . awesome ! That thing flies VERY WELL, however John’s steering would make a Boomerang Trainer look like a piece of precision equipment. Having said that, JT kindly offered me a fly at the end of the day, and YES! . . it is a truly GREAT flying plane, and very competitive. Neil Martin also flew his electric powered Integral in competition for the first time. Now that is a “machine”! Very smooth, very powerful, very clean, very precise, . . . and I flew my (aging by comparison) Integral again. Promotion Points for the competition? Neil Martin earned a Masters retainer, while John Tonks and myself both gained our second Masters promo point. Peter Ukhoff is not far off gaining his first F3A promo point if his flying continues to progress from the good form on Sunday. All done, we all had a great day. Thanks again to the Constellation Model Flying Club for their generosity in giving up the field for us on such a glorious flying day. We really appreciate it. The next competition is on March 8th at Skyawks field on Bentley Road, at Craigmore. Competition kicking off at 9:00am so see you all there a bit before that.